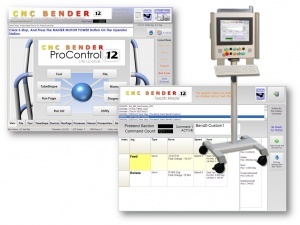 CNC Bender is ready to LEARN when you're ready to TEACH! 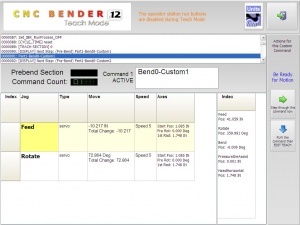 Teach Mode allows you to Jog any axis or actuator into position while CNC Bender "watches" and remembers your move exactly as you performed it. Teach the bender your knowledge for difficult transitions between bends. The power of Teach Mode shows with its ease-of-use. Actual reactions of new operators prove that this is an easy-to-learn Teach Mode system. (We've been told that our system is one of the easiest to learn and use.) Of course, that translates into time-savings and increased productivity over the long-haul. 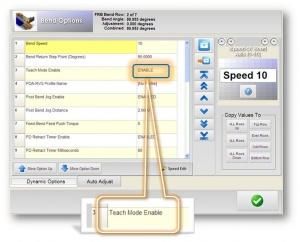 Exit the Teach Mode window and continue bending. Teach in PreBend immediately after you chuck the part and press the run buttons. 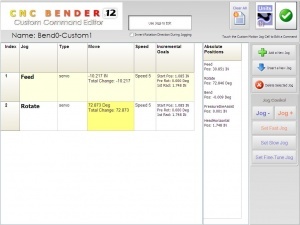 Control extra moves in PostBend using the final bend's Custom Commands. This page was last modified on 4 November 2010, at 02:53.